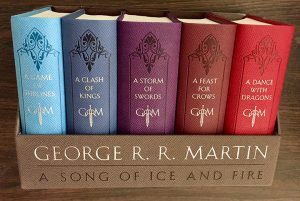 “A Storm of Swords”, “A Feast for Crows” and “A Dance with Dragons” continue the epic sagas that unfolded in the first two novels of the series: war between families on the continents of Westeros and Essos, the supernatural “Others” and the deposed king’s ambition to assume the Iron Throne. Altogether, the collection has sold more than 70 million copies worldwide, books four and five each topping The New York Times bestseller lists upon their releases. Right now you can pick up your copies of these three installments for just $3 apiece at the Book Exchange – that’s a $15 dollar savings per book, all through the month of July! Don’t forget to log on to The Book Exchange’s Facebook page for more information on the novel and a discussion with other club members! The Book Exchange – in the Tremper’s Shopping Center across from the fairgrounds.